This page is about the German twin-engine fighter Ju 88 C-6. 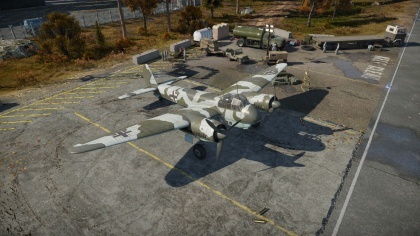 For other uses, see Ju 88 (Family). The Ju 88 C-6 is a Rank I German twin-engine fighter with a battle rating of 2.7 (AB/RB/SB). It was introduced in Update 1.65 "Way of the Samurai". 675 310 480 ~?? ~? Any fighter poses a threat to the Ju 88. 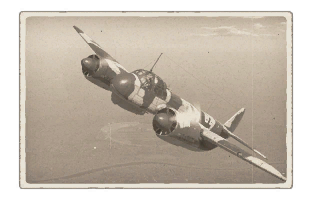 At BR 2.7 you will either face low rank monoplanes, which should be easy to boom and zoom or simply fly away from, or you could be facing cannon armed spitfires, P-39s and P-38s, which will be faster, more maneuverable and even more heavily armed than you are. Bombers are often the main target for Ju 88 pilots. They can be easily caught and disposed of with the powerful cannons. Luckily, many bombers at this BR have only light machine guns as defensive armament, making them easy targets and not particularly threatening. However, there are some exceptions. Beaufort Mk VIII - The Beaufort is fast and has a powerful twin 50 cal turret at the back. This can engage you at long range and cause serious damage to your aircraft. Try to approach it from underneath or in a head on, a blind spot for the defensive 50 cal turret. B-34 - Same as the Beaufort, it has a powerful turret with twin 50 cals. Approaching from behind is very dangerous. This aircraft also has good offensive armament, so approaching from the front is dangerous too. The best option is to hit it from underneath.